With each move, our representatives provide professional advice for every step of the moving process. Additionally we will answer any questions that arise before, during, and after your move. If you are moving locally from areas like Herndon, Reston, Fairfax, Centreville, Gainesville or throughout the DMV, Randall Movers is the proMover to contact. Randall Movers are family owned and operated, offering local and long distance moving, packing and storage services! Call 703-330-7954 today! The following information has been compiled from our experience and expertise, to help you plan and prepare for your move. Regardless of how far your move will be, its success depends on good planning and the selection of your moving company. When you select Randall Moving and Storage, you are adding expertise and experience to your "moving team," saving your time and money, and making sure that your move will be a success! Fact: According to the Employee Relocation Council, moving is the third most stressful event in life, following death and divorce. Fact: Moving yourself can cost as much as hiring professional movers. Why do so many first-time "self movers" hire a professional moving company for subsequent moves? The following questions and answers are provided here to help you plan your move. If you have a question that has not been answered below, please call us and ask to speak with a Randall representative. Q. When should I call a moving company? A. The earlier, the better. It is wise to give any moving company from 4-6 weeks notice if possible. The more notice you provide, the more likely we can meet your desired delivery schedule. Q. When is the best time to move? A. 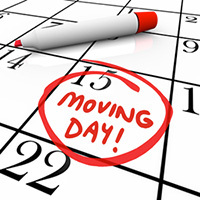 If you have the option to schedule at will, we believe you should move when it is most convenient to you. But you may want to avoid summer months, the end of the month, of the end of year holidays. This is when the heaviest demands for movers occur. Q. What moving insurance is provided automatically and how much does additional insurance cost? A. The amount of insurance coverage automatically provided is based on the weight of each item. Currently, government regulations have set this automatic coverage at the rate of 60 cents per pound per item. Additional insurance can be added at the rate of $10.00 for every $1000 of declared value. Q. What is meant by "Tariff?" A. A Tariff is a list of regulations, rules, available services, and resulting charges used by all moving companies when interstate transportation of household goods is required. The tariffs are published by each household goods, the provider, and include its various services. Ask your moving coordinator if a Tariff applies to your move. Q. What about my appliances? A. Randall movers will disconnect and prepare your electric appliances on the day of the move. All disconnection and servicing of gas appliances and refrigerators with ice makers must be performed by a technician prior to the move. Q. Are there items that Randall Movers will not move? A. Yes, by law we are not able to move firearms, fuels, paints and other flammable liquids. Check with your moving consultant for other items. Q. Can you provide referrals of past customers? A. Absolutely. Referrals are gladly provided upon request. Q. Do you have hired staff or do you hire movers on the fly to address needs? A. We have full time, experienced, and friendly personnel. Q. Can my possessions be stored temporarily? A. If you are unable to take immediate possession of your new residence or business office, yes, your belongings can be stored with us in our secure warehouse which is monitored 24 hours a day. Ask your moving coordinator what costs would apply should you need this service. Q. I want to pack my china, crystal, and glass items. Is that OK? A. Most people prefer to have fragile items professionally packed by the experts. However, if you decide to pack these items you certainly can. Keep in mind that good packing includes wrapping items individually to provide plenty of cushioning while still creating a firm pack to avoid movement. Be certain to use a sturdy container with a lid. You will want to have a 2-3 inch layer of crushed paper on the bottom of the carton as a cushion. Pack the heaviest items on the bottom with lighter items on top with spaces filed with paper. Place plates on edge and glassware on rims for the best protection. Make sure you mark the carton "Fragile" and list the contents on the packing tape sealed box. Q. Can I leave my clothes in the dresser drawers? A. 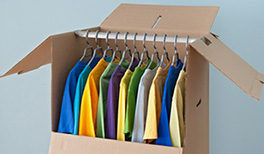 You can leave lightweight items (sweaters, blouses, lingerie) in drawers. Do not fill with heavy items like books, linens, or sheets. That can cause damage to the furniture during transport. Q. Is there anything I cannot move with your company? A. It is important to know what items cannot be shipped due to being hazardous or perishable. Q. What areas do you provide moving services? A. We move for residential and commercial customers both locally and long distance. If you are moving locally from areas like Arlington, Ashburn, Dumfries, Falls Church, Leesburg, Mclean, Oakton, Woodbridge, Springfield, Vienna, Manassas, Herndon, Reston, Fairfax, Centreville, Chantilly, Haymarket, Gainesville or throughout the DMV, Randall Movers is the ProMover to contact. Q. What size moving trucks do you have? A. Our fleet of moving trucks meet capacity needs from small apartments to large business needs. Q. Do you sell moving and packing supplies? A. Yes, we sell moving boxes (including specialty boxes like wardrobe and highly fragile items), packing paper, bubble wrap, tape, and more. If you need it to pack we have it. Q. Do you provide packing service? A. Yes, we can come in and pack your whole house or just a room. We are here to help you with all your moving needs no matter how small or large. Q. I need my items stored temporarily until our new home is ready. Can you do that? A. Yes, our monitored warehouse is designed to store your items for that very need. We also provide long term storage solutions. Q. Do you only provide solutions to home owners or can you do an office move? A. We absolutely support commercial and business relocation needs. If your question was not answered, please complete the Comment section on our Inquiry Form and we will promptly respond. Many factors affect the overall cost of a move. For local moves, much of the cost is determined by manpower. This includes packing time, loading time, and unloading time. For long-distance moves, major costs also include weight and distance and gas. The following money-saving tips address all of these issues. Your Randall representative will also discuss these in more detail with you during your planning process. If you don't use it, lose it. Check your attic, your basement, your wardrobe. Sell, donate, or discard items that are no longer in use and can be parted with. Review your future floor plan. If a piece of furniture doesn't fit, give it a good home before you move. You've consolidated and still have boxes of books. Consider shipping them separately through the mail. Special postage rates may save you money. Consider leaving behind outdoor items such as swing sets, sheds, and other replaceable items. This eliminates weight as well as tear-down and set-up costs. Take a photo and video inventory of your possessions before you move. This information can save you money in the event of a damage insurance claim during the move or at some future time if you have a homeowners insurance claim. Keep records of all of your donations and their values. Also keep all receipts for expenses incurred throughout the moving process. All of this information could qualify you for certain tax deductions. Check with the IRS or your accountant for details and eligibility. Regardless of who packs (you or the movers), start collecting packing material as soon as possible. This includes cartons, wrapping paper, a marker, and packing tape.